« Jacob Greathouse Gives Great Pilates! Last month I visited the beautiful Rough River Lake area with some of my family members. While we were walking into a quaint general store in search of ice cream, my 16-year-old nephew was stung by a bee! After the screaming and panic subsided, he said he still felt the stinger in his head. Luckily, we had two things going for us: 1. my nephew has very short hair and a pale scalp so it was easy to see the bee sting site and stinger and 2. we had a brand new first aid kit in the car with tweezers, cold pack and bandages. We were able to remove the stinger, care for his wound and continue on to our next adventure! Disclaimer: I received this first aid kit for free from a product representative from Magid that asked me to review his products. 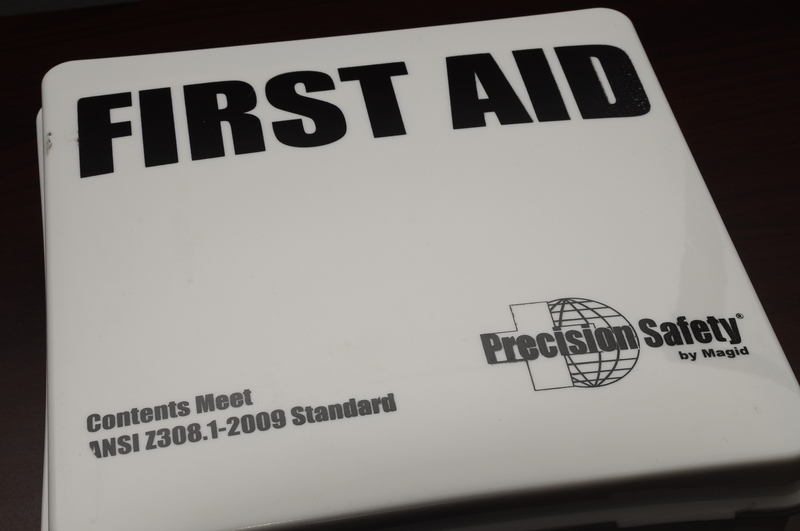 I agreed with the caveat that I would provide an objective review and would tell my loyal readers about the free first aid swag (valued at $25). 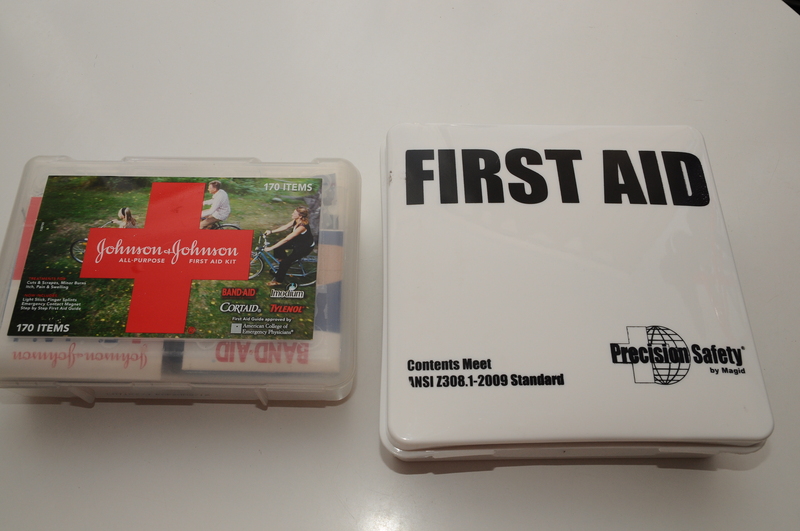 Rather than simply review the Magid® Precision Safety® ANSI-Plus General Purpose First Aid Poly Kit from Magid, I decided to compare and contrast Magid’s first aid kit with one I had purchased previously from Johnson & Johnson. 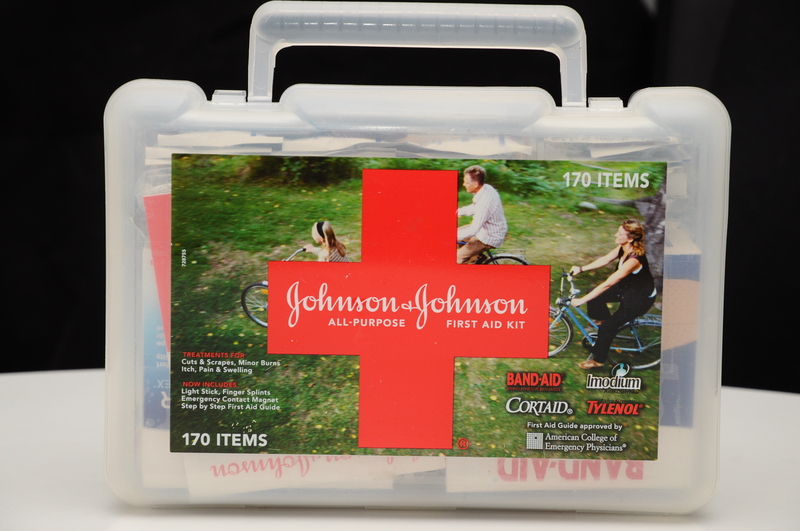 The First Aid Kit from Johnson & Johnson is more of a home consumer kit and has a handy handle for easy portability to an injured person or accident site. The kit from Magid is geared more towards the workplace, but is basically the same size and contains many of the same items as the J&J kit. It does lack the handy handle that Johnson and Johnson’s kit sports. 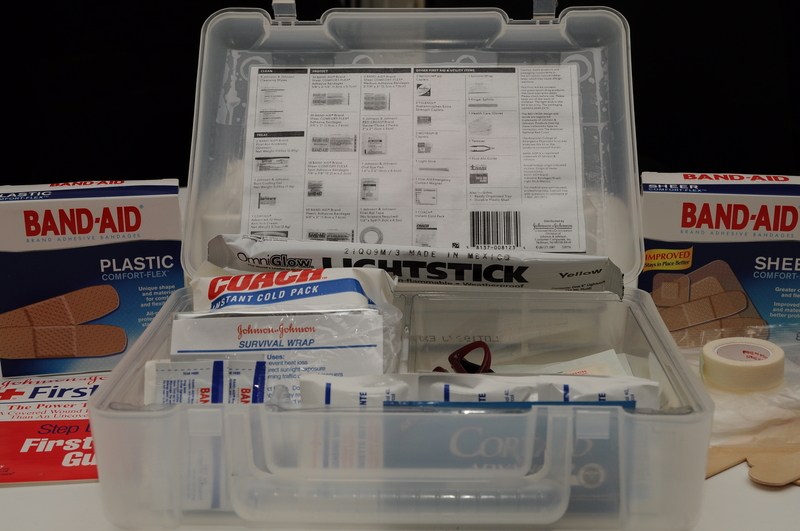 Both first aid contain many of the same items, but one thing I liked about the Magid kit was that in an emergency situation, all the products inside the kit were clearly labeled in large point type and color coded. I was able to find the tweezers, instant ice pack and insect sting pad in seconds when my nephew was in pain. The tweezers in the Magid First Aid Kit are hard plastic versus metal, but worked well and were easy to handle for tasks like removing bee stings (and likely to remove splinters, another common first aid need). The tweezers in Johnson & Johnson’s kits were not packed in sterile plastic packaging but were resting in the kit with no protective covering. A small detail but in this age of infection and since plastic tweezers can’t be sterilized via fire, an important detail! One thing missing from the Magid kit that was in the Johnson & Johnson kit was a tongue depressor which can also be used to splint broken fingers. I’d prefer 2-3 tongue depressors in my first aid kit and I ended up adding them to the Magid kit myself for future outings. Johnson & Johnson’s kit also came with a light stick which is great for travel or if electricity goes out in a storm. 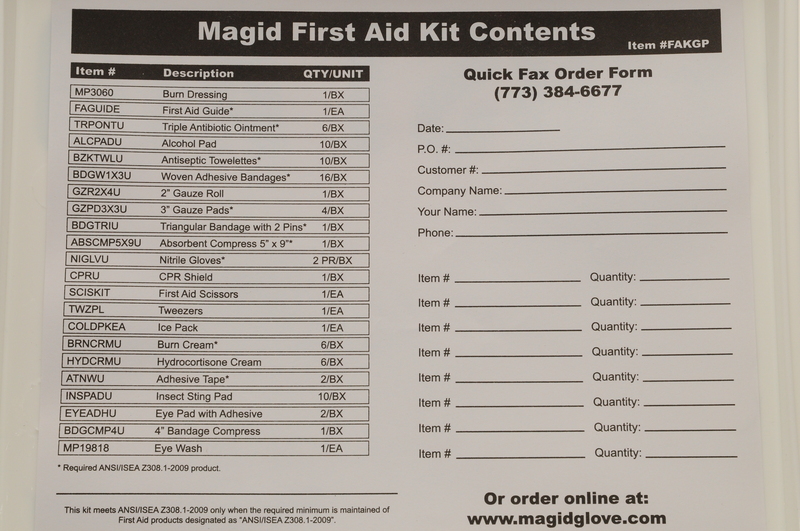 Magid’s First Aid Kit product list is shown in the photo below. 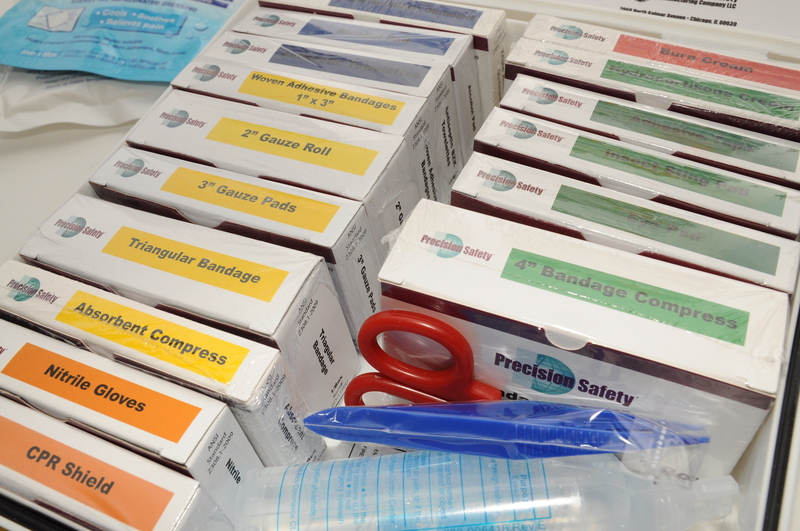 Note that it includes eye wash, CPR shield, burn dressing and nitrile gloves (for those that are allergic to latex). Johnson & Johnson’s kit contained an eye pad but no eye wash. In an industrial or office situation or even for children at home, being able to clean someone’s eye if it comes into contact with a substance requiring eye flushing is essential. I do prefer Johnson & Johnson pictorial labeling of their First Aid Kit Contents over Magid’s list because in an emergency, it’s is easier to look for the item you need pictorially and if English is not your first language or if you have any difficulty reading, providing both words and pictures is more helpful!. Overall both kits have items the other does not, so I combined the lightstick and tongue depressors from Johnson & Johnson’s kit with the Magid kit for car travel. I do wish the Magid kit had a handle! 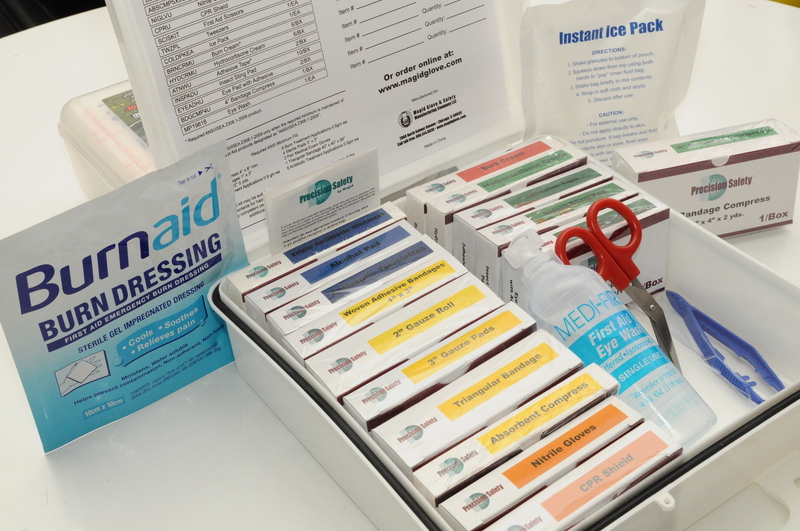 ANSI-Plus 22-unit kit contains essential items suitable for the convenient and fast delivery of first aid treatment; durable, white poly box with rubber gasket to keep moisture out; wall mountable; equipped with handle and safety seal; refills available; ANSI Z308.1-2009 compliant. The kit retails for $25 at Magid. 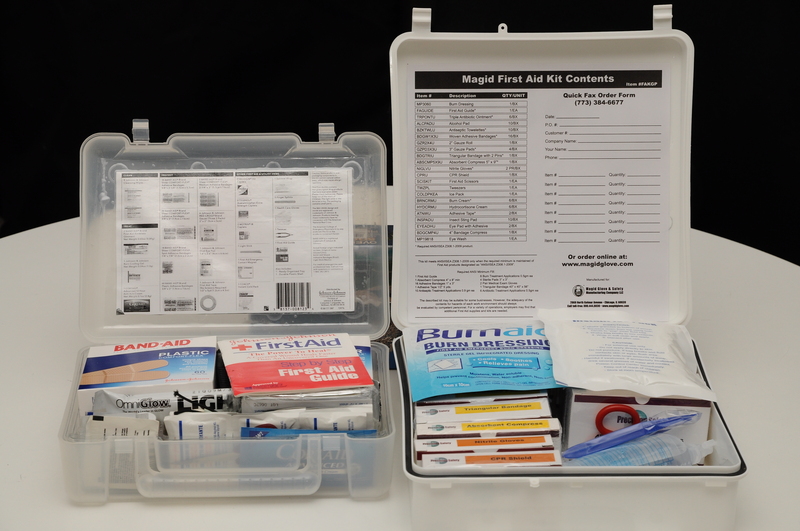 To order products such as the First Aid kit from Magid, click here. And to order replacement tweezers and other items for your first aid kit, click here.